The main objective of the project was to instill cultural understanding among elementary school children. The presentations were filled with cultural artifacts from across the globe, information, activities, and enthusiasm. The SHARE interns spent most of their time addressing cultural differences and similarities in dress, values, history, and climate. This project was established by Mr. Nicholas Whitaker, a former intern of the SHARE Institute. This fall interns visited White Rock Elementary School and Twin Rivers Elementary School. The interns’ visits were well-received and the students at both schools enjoyed the presentations and activities tremendously. During April, the SHARE interns visited White Rock Elementary School. The cultural awareness event introduced the children to multiple countries of the world and their respective cultures. Interns told the children about geography, music, food, and cultural traditions from several countries including Kenya and Thailand. Cultural Awareness is an activity directed towards teaching children about the importance of diversity and travel cross-cultural understanding. In late March, the SHARE Institute visited Cirby Preschool, which caters to children ages 3-4 from low income families. 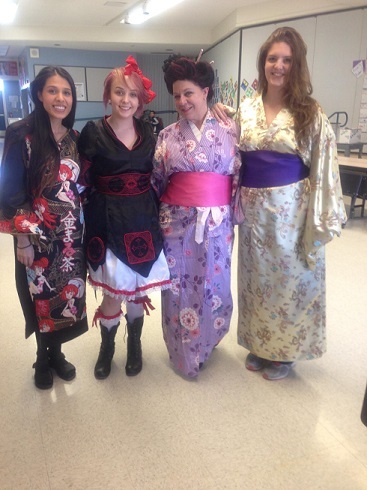 The Cultural Awareness event introduced the children to some of the cultures of the world. Interns told the children folk tales and taught them about the local food, geography and native animals from several countries including Kenya and Nicaragua. The culture of Japan was also discussed. SHARE Interns worked with young children at Fairy Tale Town in a cultural awareness program to teach them about cultures of the world. In early March of 2010, interns from The SHARE Institute traveled to Fairytale Town in Sacramento, where they hosted a cultural awareness event for visitors of the beloved children’s park. The event was very successful, drawing 60 park visitors into the theater to watch their presentation packed full of information on various cultural items and customs from around the world. The event was a rousing success and the interns will return to Fairytale Town on April 18th, 2010 for an encore! This year, interns continued the cultural awareness program by visiting local elementary schools to teach children about some of the diverse cultures of the world. The children enjoyed presentations that included colorful artwork, music and craft projects. SHARE is proud to announce that it is continuing its “Cultural Awareness Program.” SHARE interns have been busy visiting local elementary schools the past few semesters. New interns have joined the implementation team; as a result, the project has been able to reach more children. The presentations are infused with cultural artifacts from across the globe, information, activities and enthusiasm. The SHARE interns spend most of their time addressing cultural differences and similarities in dress, values, history, and climate. To reinforce these ideals the interns utilize various cultural objects, maps, and music. The current unanimous favorite “show and tell” item is a bottle with a cobra suspended in rice wine from Vietnam. The hope is that by educating as well as entertaining the children we will help them develop a cultural relativistic world view. The SHARE Institute was awarded a mini-grant by the Sacramento Region Community Foundation to continue the cultural awareness program. During this program, interns traveled to different elementary schools promoting cultural diversity by providing interactive presentations of different cultures from around the world. This grant has allowed the program to expand to the Bridges After School Program in the Arden Arcade area. SHARE is proud to announce that it has continued its “Cultural Awareness Program” for the third year. SHARE interns have visited over 40 elementary schools in the local area over the fall and spring semesters. The program has definitely expanded; there are four new interns who joined the implementation team. As a result, the project has been able to reach more children. Through discussing our cultural differences we also hope to find common ground and unity. This past spring, the interns visited 13 schools in the Arden-Arcade region. These were predominately elementary schools and two were middle schools. This year, the SHARE Institute was awarded a grant by GABY, the Grants Advisory Board for Youth to hold a cultural awareness project for elementary school children in the San Juan Unified School District. That same year, another grant was given to SHARE to expand the program to schools in Rancho Cordova and Elk Grove School Districts. Through the expansion of this program, we were able to bring cultural awareness to an even wider range of students. As part of this program, interns of SHARE visited classes and spoke about different countries throughout the world. The interns dressed up in native clothing and taught the children interactively about different cultures. After the lesson was completed, the children would engage in an activity of beading bracelets using the color symbolism the children learned about in the presentation. The SHARE Institute also received a grant from the San Juan Unified School District for a cultural awareness program on Mexico. SHARE interns visited San Juan elementary summer Discovery Clubs throughout the duration of the summer. The presentations focused on the ancient civilizations and modern day Mexican culture. The children had already learned about Mexico in their classes, and SHARE was able to enhance their knowledge about this country. After each presentation, children were able to participate in a beaded bracelet activity. In 2005, the SHARE Institute continued the cultural awareness program, hosted in part with the Bridges after School Program and the Discovery Club. The schools visited included Kingswood Elementary School, Del Paso Manner, and Marvin Manner Elementary. SHARE interns traveled to these schools to educate children about different cultures, art, and music from around the world. After each presentation, children answered questions and made jewelry that resembled other pieces they had seen throughout the day.